Why does Greengenes assign more features at the class and order ranks than Silva? Here, Silva and Greengenes assigned similar proportions of features at the phylum level (note that domain is 0 because I filtered the reads to obtain bacteria only), then Greengenes assigned more for the class and order ranks, after which Silva assigned a greater proportion of features at the family and genus ranks. Since Silva does not curate its database to include the species level, it makes sense why Greengenes assigned more features here. Has anyone else observed this pattern that Greengenes assigns more features than Silva at the class and order ranks? This seems somewhat counterintuitive considering that Silva is the larger of the two databases. I have looked into the publication SILVA, RDP, Greengenes, NCBI and OTT — how do these taxonomies compare? by Monika Balvočiūtė and Daniel Huson (2017) for answers and noticed that in the Venn diagrams depicted in Figure 3, the amount of unique taxa in the Greengenes database increases until the order rank and begins to decrease from family onwards, mirroring my observations. However, I am not sure if there is a concrete reason for this similarity or if I’m seeing this pattern simply because I am searching for an answer. 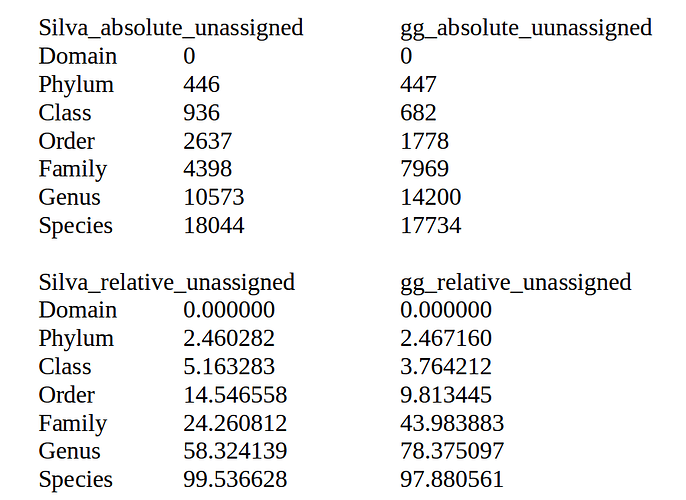 So, in short, my questions are: Why does Greengenes assign more features at the class and order ranks than Silva? Based on the table provided, which database is better suited for my analysis?